an API for handling HTML fixtures which enable you to load HTML code to be used by tests. Next step, create a js file containing jQuery plugin code. It is a simple plugin that adds red class to affected element. 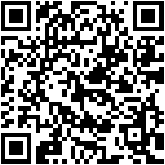 And finally html code that uses previous functionality. Not much secret, a div element modified by our jQuery plugin. Now it is time for testing. Yes I know write tests first, and then business code, but I thought it will be more appropriate to show first the code to test. So let's write Jasmine test file. First thing to do is add a description (behaviour) of what we are going to test with describe function. Then with beforeEach, we are defining what function we want to execute before each test execution (like @Before JUnit annotation). In this case we are setting our fixture to test plugin code, you can set an html file as template or you can define html inline as done here. And finally the test, written inside it function. Our test should validate that div element with id content, defined in fixture, should contain class attribute with value red after running redColor function. 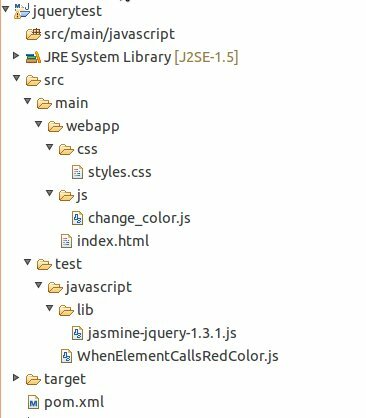 See how we are using jasmine-query toHaveClass matcher. 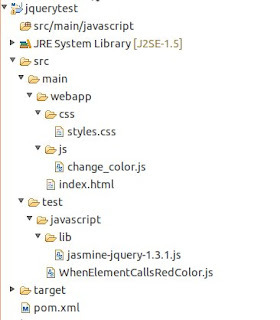 Let's see how to configure jasmine-maven plugin. First thing to do is register plugin into pom. All these parameters will change depending on your project but in case you are creating a Maven war project, this layout is enough. Hi Javin, thank you very much for your comment. I am happy you have found useful.